Without Al Horford, the Hawks will be down a two-time All-Star and their leading scorer at 18.6 points per game. Hawks forward Al Horford will undergo season-ending surgery on Tuesday in Atlanta, the franchise confirmed to FOXSportsSouth.com. Horford suffered a torn pectoral muscle in his right shoulder Thursday against the Cavaliers, with an MRI on Friday revealing the severity of the injury. It’s the second time in three years Horford, 27, suffered a torn pectoral, tearing the muscle on his left side in January 2012. Atlanta currently sits third in the Eastern Conference at 17-14, trailing only the defending-champion Heat and Pacers, and keeping that spot will mean finding a replacement for one of the team’s most productive players. At time of his injury, Horford was the Hawks’ leading scorer (18.6) and rebounder (8.4), though Paul Millsap has since tied him for the rebounding lead. That made Horford one of just six players in the NBA to top the roster in both categories. He’s also among the league’s better defenders at the rim, holding opponents to 47.8 percent shooting. Horford’s surgery was first reported by Yahoo! Sports’ Adrian Wojnarowski. 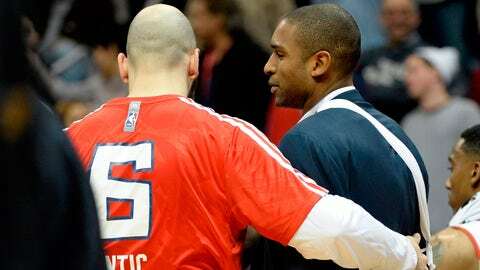 Without Horford, the Hawks will likely go with a rotation of veteran Elton Brand, 34, Pero Antic and Gustavo Ayon. Antic has seen the brunt of the minutes so far, playing a combined 42 in two games without Horford, with Brand seeing 33 minutes and Ayon 10.